I have had a few tough travel days, and even though the weather is nice for travelling, I decide to hang out in Huntsville for a day to work on bike and equipment repairs, route planning and related computer activities. I had a nice “Atkins” lunch and dinner at the Bandera Grill next door. This entry was posted in Cycling Trip: Sugar Land TX to Memphis TN and tagged Cycling, Texas on August 23, 2012 by nodyrb. 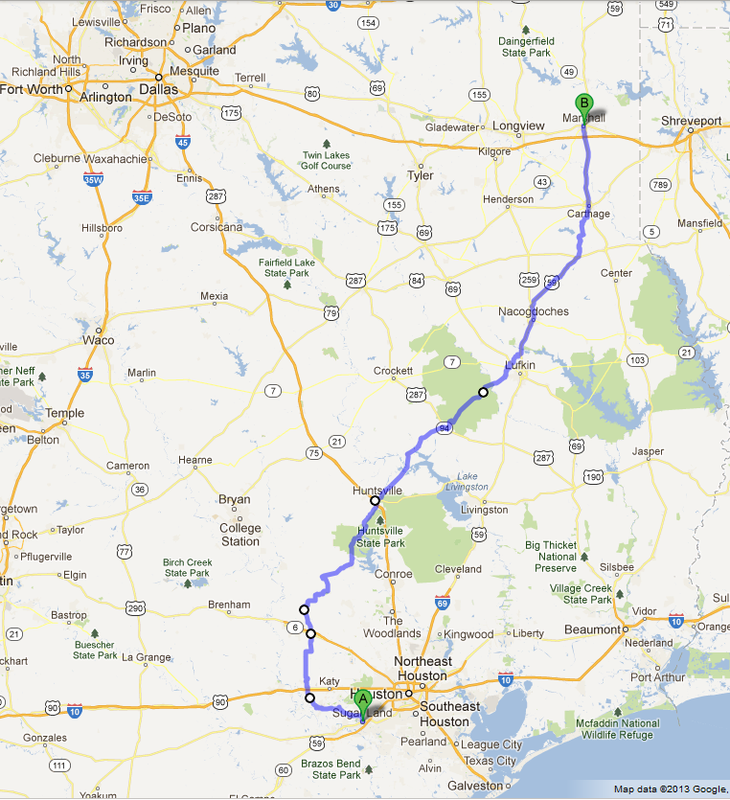 Route: Navasota to Huntsville Econo Lodge. At departure in the morning, I left, encouraged that the main purpose of the trip was fulfilled, and didn’t fuss about the daily logistical details. Anything I did from here on was interesting, but additional achievement beyond the goals of the trip. Hmmm … did I set my goals too low? About 5.5 miles into trip, the pannier is a little loose, and the right side is caught in the rear spokes, tearing the bag open. Repairs made on the side of the road. Hooray for duct tape. At the hotel in Huntsville, the crickets in and around the hotel were awful. They were in the passageways, the pool, and a couple made it into the room. Head/cross wind most of the trip. This entry was posted in Cycling Trip: Sugar Land TX to Memphis TN and tagged Cycling, Texas on August 22, 2012 by nodyrb. Travel: Brookshire to Navasota Best Western via hwy 362. I had never travelled hwy 362 North of hwy 290 before; this is the start of the “new stuff” for me. This part of the highway varied between good wide shoulders and none, nice flat pavement and chip seal. There were a number of hills North of hwy 290 that I wasn’t expecting. I finished my water, and was resting on the side of the road when a guy in an SUV stopped. I told him I was a bit thirsty but was otherwise okay. I asked about any stores on the road ahead (one, about 10 miles). He left, I travelled on, and we met again at the junction with FM 2, when he returned with 2 bottles of water he had obtained from somewhere. It turns out he was a coach/trainer for a Texas A&M University women’s sports team and he was traveling with the women for an event somewhere. While we chatted at the corner of hwy 362 and FM 2, 2 a couple of maroon buses full of student athletes rounded the corner with some razzing – I’m not sure if this was directed at him or me. Yay TAMU. A few miles later was the store (Whitehall, TX). A light lunch, rest, water, then head on out! Highway 105 is a very nice road for cycling – smoothly paved with a nice wide shoulder. There was still a light head or cross wind for most of the trip. There were even more dead frogs on the road. I had a minor collision with a pickup truck (~5 mph) at a gas station just before the day’s stopping point (corner of hwy 105 and 6). The hotel was nice, and a welcome sight after 52 miles of pedaling. There was a nice steak restaurant nearby where I had a good “recovery” meal. Doing 52 miles is a considerable accomplishment for me. This entry was posted in Cycling Trip: Sugar Land TX to Memphis TN and tagged Cycling, Texas on August 21, 2012 by nodyrb. Travel: Home to Brookshire Executive Inn. Hwy 362 from Pecan Grove/Plantation blvd. Light headwind from Fulshear to Brookshire. No conventional roadkill on the highway, but for some reason, there are a large number of dead toads/frogs on the highway, and a weird light odor that I don’t recall from previous trips. Whatever, I can handle it. I had previously done all of this part of the trip on my own twice before, so wasn’t expecting any surprises. I was a bit nervous from starting this trip on my own with no backup or support, but the fact that I had done this segment before made it much easier on the soul. This entry was posted in Cycling Trip: Sugar Land TX to Memphis TN and tagged Cycling, Texas on August 20, 2012 by nodyrb. In early 2012, I wanted to go on a relatively short, unsupported cycling trip on my own. In August 2012, it became a reality, when I rode my bike from home in Sugar Land, TX to Marshall, TX, which was 320 miles away by the route I took. In August 2012, I departed on my cycling trip somewhere “North and/or Northwest”. I had never done this kind of thing before, and wasn’t sure what to expect. Really, it was a sort of dry run for perhaps a longer trip if I discovered that I enjoyed myself and didn’t encounter any disasters or showstoppers. I’d done about 4000 miles of cycling on my road bike either unsupported/by myself, or on rides up to 100 miles a day, which were supported/part of a group. I planned a route, but didn’t have a specific finish line in mind. I determined that if I made it past 100 miles and 2 nights that it was a success. Anything after that was additional accomplishment/bragging rights. Mission success was reaching Navasota by day 2. I tentatively targeted Memphis, TN as final “dream” destination. If I did that really well (ha ha), then I would proceed further north. I had no idea how I would get home (trip completion, emergency or otherwise) or where I was going to end up. Travel choices for the return trip seemed to be (1) ride back, (2) rent a car one way (3) Amtrak or bus (4) benevolence of friends (5) drop/sell the bike and fly back. I planned on staying the first night in a hotel in Brookshire, 35 miles away. I’d ridden my bike and stayed here twice before, connecting with organized club rides out of Brookshire (the organized part of the past ride started in Brookshire; I rode the 35 miles there myself and stayed in a hotel before/after the organized part). I had subsequent overnight spots picked out as contingencies and would select the next one based on how much mileage I could muster. Planned daily travel: 20 to 60 miles a day, primarily determined by hotel location. I have read from other people’s blogs that a reasonable day on a multi-day trip is 35 to 65 miles per day (excluding all the extreme trips and super-fit athletes). I am not an athlete by any measure and not in the greatest shape. I set my sights lower right to start off with. If I did better than expected, I could revise my standards upwards. I figured that this was much more realistic and less humbling than overestimating and revising downward. I observed that for long distance travel by bicycle, a better strategy is country roads and small towns. There is a lot more trouble when you get near larger cities. Travel within a city is downright dangerous. If I was going to travel great distances, the route challenge was going to be getting around large cities, and crossing rivers. Most river crossings are on major highways, built to accommodate high speed vehicles, and not bicycles or pedestrians. I have sleep apnea and need electricity overnight. For this trip, all nights would be spent in hotels. No tent, sleeping bag or camping gear (even as backup). Enough of all of that. On with the ride! This entry was posted in Cycling Trip: Sugar Land TX to Memphis TN and tagged Cycling on August 15, 2012 by nodyrb.